Inspired by Kim-Mai Cutler and Cardiff Garcia, I set out to try and quantify the Housing Trilemma across the nation’s 100 largest metropolitan areas. It turns out to be very real. 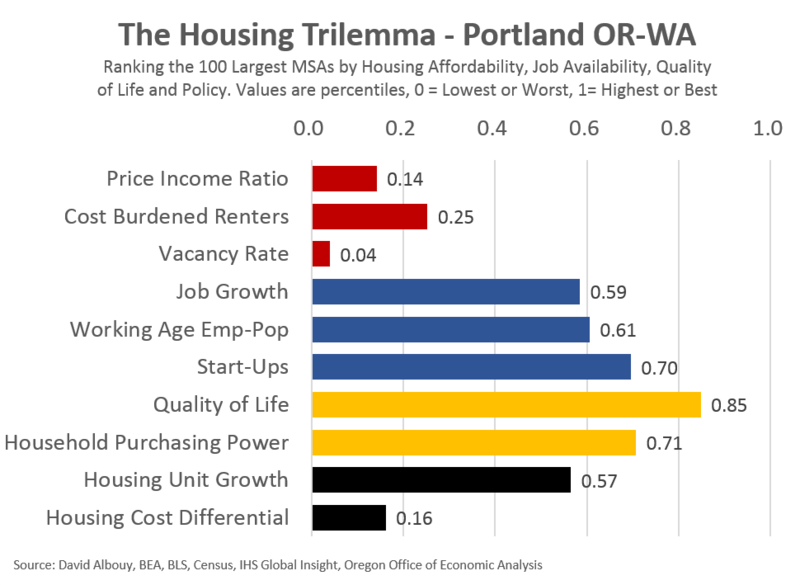 Just eight rank among the top half for all three dimensions of the Housing Trilemma. None rank among the Top 20 in all three. Unless you prefer living on the Great Plains, that list of eight metros lacks sizzle*. Update: All 100 MSAs fall within the Venn diagram below. The metros listed are to show some individual metros that are representative of each part of the diagram. For example, New York City slots in right between San Francisco and Portland. Kansas City is just to the right of Oklahoma City. And so forth. Email me if you would like a version with your metro on it. 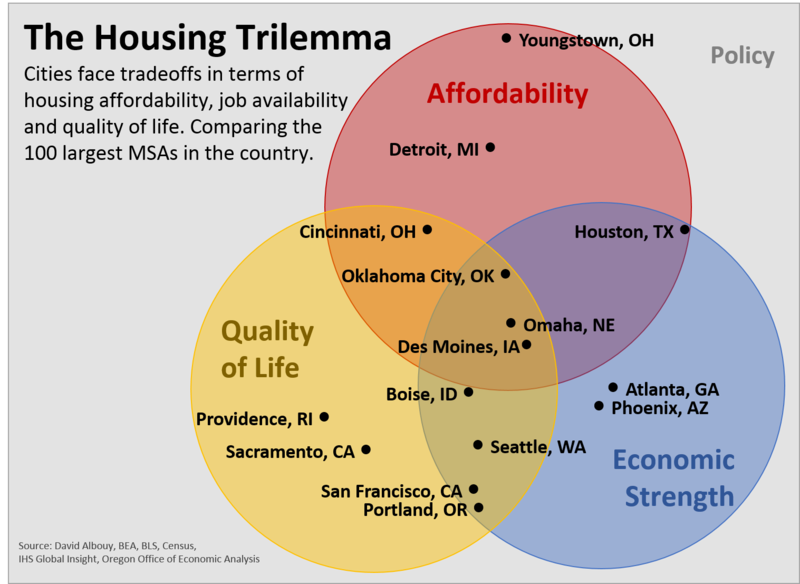 Below are the Housing Trilemma graphs for Portland, Houston and Youngstown to give a few examples of how each city compares to the nation’s 100 largest metros. Note that the bars represent percentiles, or rankings. This is to make the graph easy to read and visually intuitive. The longer the bar, the better a particular metro ranks on that measure. Click here for an interactive version** where you can pick and choose any metro to examine and/or download the data. Go to the “graph” tab and choose a metro from the dropdown menu. Take it for a test drive. The specifics of each metric are shown at the end of the post. Clearly a few patterns emerge. In particular the popular metropolitan areas stand out, not least because their eroding housing affordability is constantly discussed. What you could call the cool city profile is seen in the Denvers, Portlands and San Franciscos of the world. In a way, they are victims of their own success. Their strong regional economy and high quality of life do come as the cost of lower housing affordability. 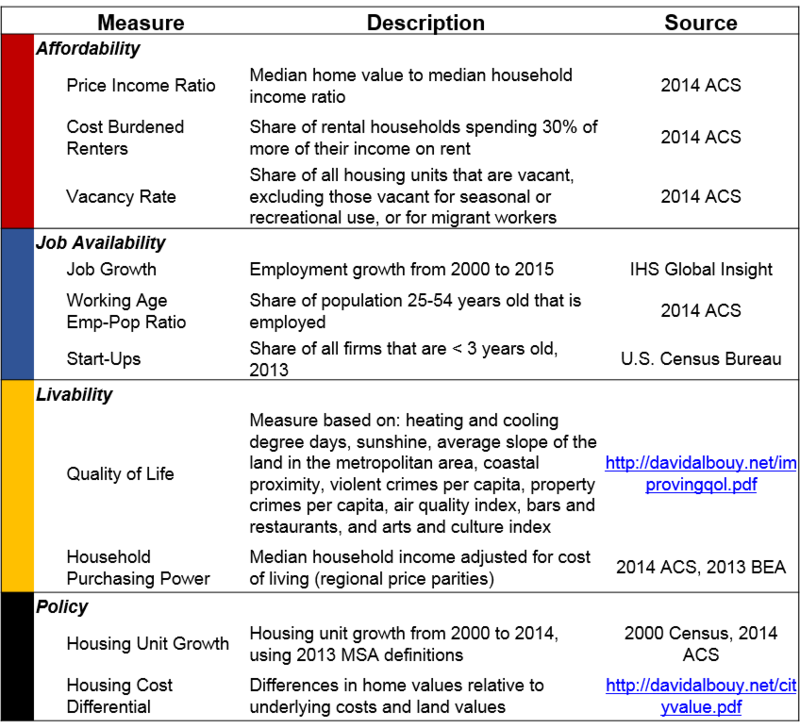 Yet even among this group, affordability does vary. Portland is an extreme case with significantly more households cost-burdened and a lower vacancy rate than nearly all other metros in the nation. This impacts renters the most, including younger households and those on fixed incomes. For these popular metros, more construction is required, but that alone is not enough. Just look at Austin, TX. The region has a very strong economy and high quality of life. Despite leading the nation’s largest metros in new construction, Austin is only able to reach middling affordability. Austin’s home prices, while lower than Portland’s or Seattle’s, are still relatively high and half of all renters are cost-burdened. Increasing construction is able to help with broad, regional affordability, but cannot fully offset the premium required to live in a popular place. In addition to building more homes, targeted programs are also needed to help less fortunate neighbors bear these costs. The housing trilemma is real. Tradeoffs are inevitable. Here in Portland and the Northwest more broadly, we are fortunate enough to have a good economy and desirable quality of life. We should work to maintain these successes. However, eroding affordability in Portland does not have to be a permanent trend. Increasing construction to match a growing population and strong assistance programs are needed. Here are the exact measures used. * Full disclosure: I am from the Great Plains and many of my relatives still live there. However, my wife likes to joke that it’s a great place to be from. These metros usually don’t knock it out of the park on any particular measure, however they are successful and do rank relatively well when compared to the rest of the nation’s largest metros. ** Apologies for the external dataviz link. Having difficulty embedding the work on our site. Let me know if you have any questions. Unfortunately the “Graph” tab doesn’t seem to let me choose anything from a drop down menu. I downloaded the excel document manually and was able to access the drop down, however the formatting is all off so the output is meaningless. Thanks Nate for the heads up. Updated the post with an Excel download. Let me know if that doesn’t work. Why is household income listed under quality of life and not under economic strength? An economically strong region is one with high wages and vice versa, and sometimes it’s even in opposition to quality of life issues. (If we think of quality of life as consumer amenities – clean air, good schools, pleasant weather, short commutes, etc. – then these tend to suppress real wages, because workers are willing to accept lower wages to get these benefits.) By this metric, Houston is still an economically strong city, but Atlanta, which has had negative per capita income growth since 2000, isn’t. For these purposes, it is included under Quality of Life in the sense of how far one’s dollar goes in a particular city. So the combined QoL looks at the consumer amenities and how much the typical household can afford when it comes to purchasing things. It is adjusted for cost of living as well. But, to your broader point, yes income is also an economic measure too. Why does the chart have so few cities? Where is NYC, DC or LA? There are simply too many cities to list on one graph. A few representative cities are listed for each part of the chart to illustrate the types of places in each area. This is a great graph, I bet a talented graphic designer coukd embed several hundred towns in a few pixels that only become viewable when mouse rolls over it. I would love to see this promoted much more. Cities are where more and more of us will live, from Detroit to San Francisco, from Omaha to NYC, cities are usually the fortune tellers. If we don’t get this affordability versus livability and economic success right, most regular will be like non-coders, non-real estate speculators in SF….screwed….a lucky few will be in Elysiums, the rest of regualr people wI’ll be spending more than half their earnings rent. The PNW is going to go through all sorts of growing pains and it’s deep in another housing bubble. I’ve noticed this for a while now, but Seattle is far more affordable than Portland. Housing costs are about the same (cheaper in some parts of Seattle for a good neighborhood and school district), but incomes are higher in Seattle, plus you don’t have the 10% Oregon State tax to deal with, which is like getting nearly a 10% raise in itself. If you aren’t already settled in Oregon, there just isn’t much to offer anymore, yet people continue to pile in with outside money and fan the flames. Until Portland starts building up apartment, condo, and mixed-use high rise buildings, the housing crisis will continue there. Seattle is a tad better but still doesn’t have enough high rise living either. It’s a city, time to start building up like one. Phoenix is pretty affordable and has an excellent quality of life, I am a little surprised it is scored so low here. Maybe it’s the political climate, which is grouchy sometimes. There are good houses in great areas in Phoenix for $250,000 or so, and wages are about the same as Portland or Seattle. Sure you’ll use air conditioning for about four of five months of the year, but it’s sunny for 12 months too. Many houses have pools as well. A lot of people go vacation in Palm Springs, but Phoenix is living that fulltime. Atlanta is also very affordable, another place I am puzzled why it’s rated so poorly here. It’s affordable, beautiful, polite people, good economy, just as green as the northwest, but far sunnier. Why the low rating? The humid summer months maybe? You can buy a nice house in Atlanta for $150,000, try that in the northwest! But overall yes the midwest is really an impressive place for affordability, income, and quality of life. It’s almost like people have forgotten it exists, flyover country and all, but holy cow is it nice. I have a relative that was transferred to the midwest from Seattle, and they’re just shocked at how cheap everything is in comparison. $200,000 buys you a home that would cost a $1 million or more in Portland or Seattle. They make the same amount of money there too! Spend some time in Minnesota and it is pretty amazing, the winters are overblown and really not much different from a winter in Spokane, except they salt the roads out there so it’s much easier to drive around. Thanks for the comment and appreciate the insights and perspective here. When looking at all 3 affordability metrics, Seattle does rank 20 places higher than Portland due to a much smaller share of the rental population being rent burdened and a higher vacancy rate. As for Phoenix and Atlanta, while both Sun Belt cities they are a little different in the data used here. Phoenix has a very good Quality of Life in the academic work but relatively low household purchasing power. Atlanta is the opposite. They both rank around 50th or so for the affordability, so certainly pretty good but not great across all 3 measures. Why aren’t diversity, number of colleges/university, or educational attainment included in quality of life? Or perhaps even something like community social capital? http://www.ksg.harvard.edu/saguaro/communitysurvey/results5.html Why include slope? I will defend Seattle a bit. My Dad was Air Force and I have travelled quite a bit since those days in addition. Having lived in Texas, California, Ohio, Delaware, Maine, Florida, South Carolina, Alaska, Massachusetts, and Maryland I can make a lot of comparisons. Seattle summers are simply some of the best anywhere while Seattle winters are tolerable if you can live with grey skies. Snow is rare. Housing prices and traffic are downsides. But we have no poisonous snakes, and spiders are rare. Tornados are rare. Hurricanes nonexistent. Earthquakes we do have. I do not need a one million dollar house elsewhere but thanks to Seattle I can buy one if I did. San Diego is the only place I can think of which I would classify as superior to Seattle given all the variables. For the life of me, though, I cannot figure out how Seattle is given such a high politeness rating. My travels in the South lead me to believe Southerners are far more polite in most circumstances. Thanks David; appreciate the comments. No need to defend Seattle, we do, kinda, like you guys down here. But you raise a lot of good and interesting points regarding weather and animals and the like. Not doubting your methodology but as someone living in Omaha, Omaha is cheap IMO because some quality of life basics are missing or lacking, so I’m doubtful about the accuracy of what’s going out about Omaha. Some things are here but some things are clearly absent with few conciliatory plans in the works. If omaha is that good, Lincoln should be through the roof. But there are too many cities missing completely like Boston, San Diego, Austin, Chicago, Minneapolis, Eugene, Olympia, which I can’t believe are off the chart in some direction? Thanks for the comment. All cities fall somewhere on the chart. I only listed a few representative ones for each part of it. Apologies for the confusion there. The Great Plains don’t knock it out of the park in any dimension but score very good marks across the board, hence their placement. QoL in the Great Plain metros ranks in the 30-50 range. But there are lots of jobs and housing is really affordable. Wouldn’t weather be a subjective QOL aspect? What if you like to ski or winter sports? What about education? Also, does the economic aspect keep the type of jobs in mind? The academic paper used for that Quality of Life measure basically looks at the characteristics of a place that people are willing to pay more to live in, after controlling for incomes, essentially. Research shows people are willing to move to and live in places with more moderate or mild climates. Of course that’s not the case for every single person. As for your question about winter sports, both Colorado Springs and Denver rank really high on the Quality of Life measure. And yes, there are a lot of other items or measures that one could include or exclude. I know that alternates have been tried elsewhere in the research. The type of jobs are not included in the specifics used here. The goal was to look at overall job availability and economic growth. But the types and incomes of course matter. Incomes to factor into the metrics used here in terms of affordability and also household purchasing power. Feel free to add additional variables in the google doc or in the Excel download! I’d love to see it. Some other individuals are adding things they find personally important like race and ethnicity and bike transportation, etc. Have you got a version that has L A County, Orange County, Riverside-Sanbernardino, and San Diego compared? Have you got one that compares the three large divisions of the Bay Area plus Sacramento and Stockton? California is notorious for its coastal-inland division, which is now bigger than the North -South division. I’m sure you, as an Oregonian, hate all Californians impartially, but we aren’t all alike! I’m having trouble getting anyplace but Urban Honolulu on the Google version, or Portland in the Excel version. How do you convert the data into an X-Y coordinate for plotting each city in the Venn diagram? Interesting report Josh. Have a basic question while trying to apprehend the data. Why Price/income ratio of 0.99 (Youngstown) represents a more affordable score than a ratio of 0.14 (Portland)? I was thinking ratio of 0.14 means more income compared to price so it represents more purchasing power or price is more affordable relative to income. Thanks! The data used for the graphs are percentiles of the actual data. So it shows rankings across the metrics and MSAs. This is to keep the graphs visually intuitive. The longer the bar the better the metro ranks on that measure and vice versus. The actual underlying data is available in google docs for for download in Excel, see the post for the links. Also, I did some box plots or box and whisker graphs for Portland which are better at showing where a particular metro falls in the spectrum, but hard to do that for every measure and every metro. See the link above talking about Portland as an extreme case for that work. Bars, Restaurants, Arts, Air Quality and even crime (eyes on the street) improve with density and mixed uses, increasing quality of life. This causes gentrification locally, but filtering regionally, decreasing prices on the proximity (because the affluent will move to the bullseye of quality of life, and stop bidding up their neighboring areas). Overall, this causes greater affordability (as rent decreases in less desirable neighborhoods in Seattle proper show; I’m paying 40% less rent than last year with a really small impact on my transportation costs). Close knit communities generate creative output, leading to economic strength. There is no trilemma. What exists is a landowner class and politicians in their pocket preventing coastal cities from addressing their need for higher densities.